Pub game fans can rejoice! 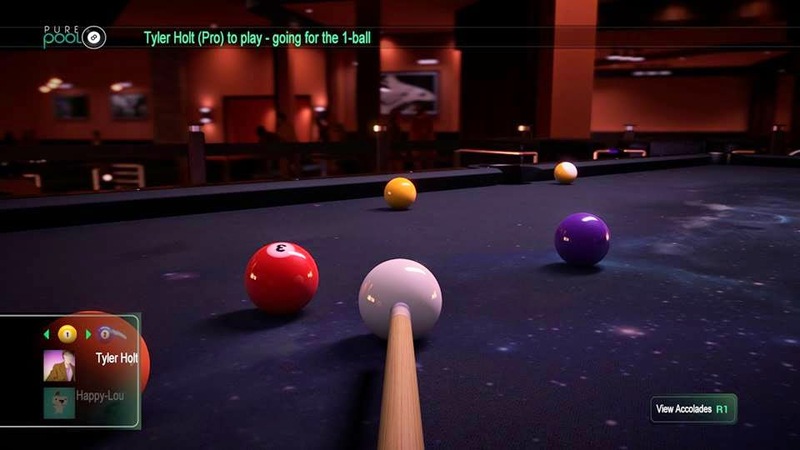 The first pool game for Playstation 4 has arrived, bringing the classic game to the new generation with Pure Pool. It's a game that can't be altered too much, so is it worth buying? Read on to find out. Pure Pool is the first of it's kind available on the Playstation 4 Store. The console is still fairly young, so for now, it's the only pool game available. It has a few different modes, all of which can be played against AI or other players (locally or online). The career mode is simply a collection of games, against increasingly difficult AI opponents. There are three stars to earn for each match, which require you to fulfill a certain condition to unlock. These range from snookering your opponent to potting a ball two metres from the cue ball, and many, many more. They add an extra challenge to the game, as you're constantly trying to achieve all of the stars. Pure Pool uses the control system that a lot of games opt for these days, which is to use the analogue sticks, without the need for buttons. You use the right analogue stick to pull back your cue, and push forward to hit the ball. There is no power bar though, so you have to naturally get a feel for the power, and soon enough you'll be pretty good at judging how hard you'll need to hit it. Aside from the standard pool games, there are some pretty fun game types. Killer is definitely the most addictive, in which you lose lives for not sinking balls. You start with three lives, and can gain more by potting black, or multiple balls in one shot. Against a decent opponent, Killer can last for a long time, and it can become incredibly tense. Accumulator rewards you for potting balls in number order, and each ball is worth one more point than the previous one. You can give away points if you don't hit the correct ball, and should you sink the wrong one, you'll basically be giving your opponent the points. There are a few other modes that are here and there during the career mode, but they aren't as interesting as the aforementioned games. In Perfect Potter, you have to pot as many balls as possible, and the game ends when you don't sink a ball. It does add some strategy, as you try to think ahead, but the same skills are used in just a generic game, so whilst it is fun, it does seem a little unnecessary. Speed Pot gives you time goals, within which you have to pot all of the balls, and Royal Rumble is almost exactly the same, but balls are periodically added to the table. They definitely add variety to the career mode, but they aren't the standout game types of Pure Pool. Graphically, Pure Pool is pretty mindblowing. There is only one location and table, but everything is incredibly detailed. The pool balls look awesome, with realistic, dynamic reflections and if you move the camera around to get a close-up view, they all have tiny scratches and scuffs on them. 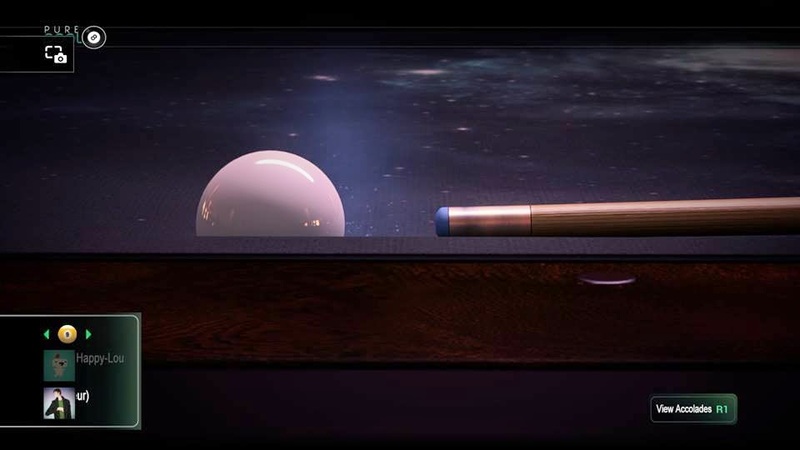 You can see the grain of the wood on your cue, and the details of the fabric on the table, and it all works together for some fantastic visuals. Perhaps the most impressive visual effect is when you go to sink the winning ball. You see the cue hit the ball in slow motion, and you can see tiny chalk clouds dispersing from the tip of the cue. It's an awesome little feature that never gets old. The sounds are also authentic, and it's very satisfying to smack the cue ball at full power and listen to it ricochet off the other balls. There's also a decent soundtrack of lounge music which sets the ambience, but is pretty forgettable. If you've been impatiently waiting for a pool game to hit the PS4, Pure Pool should definitely sate you for now. There are only a few modes, which are all pretty similar, and there definitely could be more (a trick shot mode would be welcomed with open arms), but Pure Pool is still an immensely fun game. If you enjoy playing pool, there's no reason to not buy it. Just be aware that in terms of game modes, it's a little bit lacking.